and Dr Carolyn Charman, Consultant Dermatologist, Royal Devon and Exeter Hospital. Eczema is a word from the Greek language meaning ‘boil out’. It is a good description for the red, inflamed, itchy patches that occur during flareups of the disease. Corticosteroid creams or ointments applied to the skin (also referred to as topical steroids) are an important anti-inflammatory treatment for patients with eczema, and are widely prescribed by GPs, nurse specialists and dermatologists. Unfortunately, the risks of side effects from topical steroids have been exaggerated over the years, and this means that some patients and families are understandably worried about using steroids – even when they are necessary and appropriate. As dermatologists, we know that this fear of using steroids (steroid phobia) is a very common cause for patients to under-treat their eczema. Parents in particular are often very worried about causing long-term damage to their children’s skin. It doesn’t help that there is often conflicting and confusing advice from different health professionals, pharmacists, friends, family members and the media. If topical steroids are used sensibly and correctly, they are safe and highly effective for most eczema sufferers. This article aims to provide the real facts about topical steroids, dispelling the myths, and summarising how to use steroid treatment safely. We will also discuss some of the alternatives to topical steroids, and the circumstances in which these other options may be helpful. What are the advantages of using topical steroids to treat eczema? Steroids are naturally occurring substances that are produced internally in our bodies for normal growth and development. Steroids have many functions in the body, but among other things they are very effective at controlling inflammation. The way that steroids reduce inflammation is very complicated but involves temporarily altering the function of a number of immune cells and chemicals in the skin. Topical steroids were first introduced to treat inflammatory skin diseases such as eczema in the 1960s. By producing the steroids in topical form (creams and ointments) their antiinflammatory action could be targeted directly to the skin where it was needed most. Over the past 50 years, dermatologists have gained a huge amount of experience in how to use topical steroids effectively and safely. And of all the treatments available for eczema topical steroids remain the most tried and tested over the years. Without a doubt they still provide one of the most valuable treatments currently available, and if used properly can control symptoms and restore patients’ quality of life. What are the real risks of using topical steroids? What are the real risks of using topical steroids? Skin damage Most people immediately think of thinning of the skin (skin atrophy) whenever steroids are mentioned, and this is certainly the most important potential side effect. It is true that potent and very potent topical steroids (see below) can cause thinning of the skin if used for too long without a break. This causes the skin to look wrinkly and papery, with tiny blood vessels (telangiectasia) becoming visible beneath the skin. 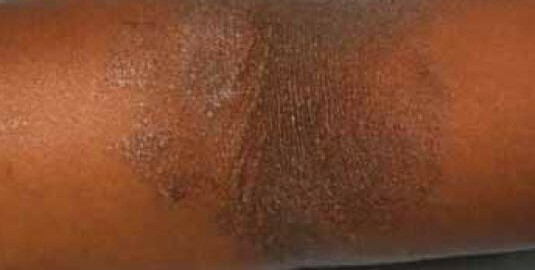 Although early skin thinning can be reversible if the steroid is stopped, with continued use irreversible stretch marks (striae) can develop on the skin. These stretch marks look like the stretch marks that pregnant women sometimes develop. However, in patients with eczema who over-use topical steroids, the stretch marks usually develop on the upper inner thighs, under the arms, and in the elbow and knee creases. Unfortunately, when topical steroids were first introduced in the 1960s they were so effective that many people were prescribed potent and very potent preparations continuously for months or years, and this undoubtedly led to skin thinning. It must be stressed that skin damage from topical steroids is now extremely uncommon and should not occur if the treatments are used properly. As dermatologists we see the more severe end of the spectrum of eczema patients, yet we now hardly ever see patients with skin thinning. This is because we now know that steroid creams and ointments should be used differently to when they were first introduced, in intermittent bursts and by using the appropriate strength and quantity. Many patients with milder eczema can control their skin with weaker topical steroids such as hydrocortisone or Eumovate® (see below). With these preparations, skin damage is very uncommon indeed – even when they are used intermittently for years – although continual use on the delicate skin of the face and eyelids should be avoided. As a result of the problems seen years ago with inappropriate use, understandably many people remain frightened of topical steroids and under-use their creams and ointments – this stops them taking full control of their eczema. In fact many of the patients we see have the opposite of skin thinning, and actually develop thickening of the skin (lichenification) – see Figure 1. This is the body’s response to the itching, rubbing and scratching when eczema is under-treated. Lichenified eczema looks unsightly and feels uncomfortable, but can almost always be prevented and corrected by treating the eczema with steroid creams. If topical steroid creams are applied regularly on the eyelid skin there is an increased risk of cataracts and glaucoma (increased eye pressure). It is generally best to use mild steroids only on the eyelids, and usually for 7 days maximum at a time. If eyelid eczema remains a problem then it is certainly worth seeing a doctor to discuss other possible treatments (see below). Topical steroids can occasionally cause spots and acne, particularly if used regularly on the face and around the mouth. On the body, greasy steroid ointments can sometimes cause small spots around the hair follicles (folliculitis), although this is uncommon. What are the myths or misconceptions? Unfortunately, the information sheet inserted with steroid creams and ointments often states that steroid creams cannot be used on broken skin. This advice is given because steroids are more easily absorbed through broken skin but, as long as they are used according to the advice of your doctor and stopped when the skin returns to normal, they are perfectly safe. The skin is often broken and cracked if you have bad eczema, and topical steroids are one of the best ways of helping the skin to return to normal. If your skin is very weepy it may be infected, so you should ask your doctor if you need an antibiotic as well as your topical steroid. Steroid creams and ointments should not be confused with steroid tablets or anabolic steroids sometimes taken by athletes, which can affect growth and development. This is because oral steroids (given by mouth) are absorbed into the bloodstream and can reduce the body’s production of natural steroids. However, steroid creams and ointments are almost never absorbed into the bloodstream, and so will not affect growth and development, or the body’s ability to fight infections. The exception is in babies and very young children when – if topical steroids are applied in large quantities all over the body (especially if used under occlusive bandages or wet wraps) – absorption into the bloodstream is possible. Hence, it is important to follow the advice of your doctor when applying large quantities of steroid creams for long periods of time in babies and young infants. For this reason, strong (potent) topical steroids should not be used in children under 12 months of age except under the supervision of a dermatologist, who would ensure that there was no long-term risk to the child. We should remember that untreated severe eczema can have a significant effect on physical, psychological and social development, and this can itself affect children’s growth and development. When steroid creams are applied correctly, we often see that a child’s growth recovers as the eczema improves, confirming that it was the eczema itself and not the steroids that were stunting the child’s growth in the first place. Very occasionally, topical steroids can cause mild, temporary, skin lightening, although this is uncommon and should return to normal when the treatment is stopped. Skin discolouration is much more likely to develop if the eczema is left untreated (see Figure 1) because skin inflammation can affect the distribution of pigment in the skin. The medical term for this is post-inflammatory hypopigmentation (lightening) or hyperpigmentation (darkening). Treating the eczema promptly with topical steroids will reduce the risk of colour change in the skin. If topical steroids are used for long periods, they can very occasionally cause a temporary, mild increase in fine hair growth in the treated areas, although this is extremely rare. 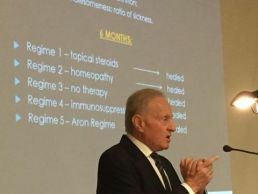 There is no evidence that topical steroids – or indeed any other treatments for eczema – change the underlying natural course of the disease. In other words, they don’t seem to make people grow out of their eczema any slower or quicker. Although moisturisers (emollients) are the first and most simple form of treatment for eczema, if used alone they will only treat the very mildest forms of eczema. In most people, they should be thought of as a way of treating the dryness and reducing or preventing eczema flare-ups. Moderate or severe eczema cannot be treated by swapping to different emollients or increasing the amount of emollient applied. Once the skin becomes red and inflamed, it requires a topical steroid (or one of the alternatives below) to bring the eczema under control. Ideally the steroid should not be applied at the same time as your emollient (especially thick greasy emollients) as this might dilute the steroid and stop it working as effectively. Allow at least half an hour between applying your emollient and topical steroid. Squeeze a length of steroid onto the tip of an adult index finger, from the tip of the finger to the first finger crease you come to (approx. 2 cm). This amount of steroid represents one fingertip unit, and should be enough to cover an area of skin the size of two flat adult palms of the hand (including fingers). One fingertip unit weighs about 0.5 g (a standard tube of steroid contains 30 g). Topical steroids typically come in four strengths: mild, moderate, potent and very potent. The difference in strength (and potential side effects) between different steroids is enormous, with Dermovate® (very potent) being over one thousand times as strong as hydrocortisone (mild). The labelled percentage of the steroid does not generally help in knowing the potency of the steroid. For example, 0.5% and 1% hydrocortisone are both mild steroids, whereas 0.1% mometasone (Elocon®) and 0.1% betamethasone valerate (Betnovate®) are potent steroids. A more potent steroid is more effective in treating eczema but also has an increased risk of side effects. For this reason it is important to use the lowest potency steroid necessary to treat the eczema, but this may need to be ‘stepped-up’ to a more potent steroid during flare-ups. For severe eczema it is often better to start with a more potent steroid to bring the eczema under control quickly, before stepping down gradually to weaker steroids as the eczema improves. This step-up/step-down approach is summarised in the most important recent national guidance for the management of atopic eczema in children, published by the National Institute for Health and Clinical Excellence (NICE) in 2007. This guidance recommends that GPs should only prescribe mild (e.g. hydrocortisone) or moderately potent (e.g. Eumovate®) topical steroids in children less than 12 months of age, reserving potent steroids for older children and adults. The guidance also recommends that GPs should not prescribe very potent topical steroids (e.g. Dermovate®) at all in children under the age of 12 years. If stronger steroids are felt necessary they should be prescribed under the supervision of a consultant dermatologist.nt dermatologist. Although topical steroids have been the main method of treating eczema for over 50 years, more recently two new topical skin treatments have been developed that contain no steroid at all. These new treatments are called topical immunomodulators, because they modulate (or alter) the overactive immune system in the skin itself (but not in the rest of the body). They do this by altering the action of specific cells called Tcells that play an important role in eczema. There are currently two topical immunomodulators that have been available in the UK on prescription since 2002 – Protopic ointment® (topical tacrolimus) and Elidel cream® (topical pimecrolimus). When are they used? Both Protopic® and Elidel® are currently recommended as second-line treatment if your eczema has not been controlled adequately with topical steroids, or where there is a risk of side effects from further steroid use. Under NICE guidelines, Elidel® is only available for use on the face and neck in patients under 16 years of age, whereas Protopic® can be used in children and adults on any part of the body. They are used as second-line treatments because, in the vast majority of people, topical steroids are extremely effective and safe if used properly, and we currently have more long-term experience with steroids. Advantages: The main advantage of topical immunomodulators is that they carry no risk of skin thinning at all, and so they can be used on any part of the body including delicate areas such as the face, eyelids, elbow and knee creases and groins, where they work particularly well. Furthermore there is no restriction on the length of time the treatments can be used for. They are also very effective at maintaining control of the skin once the eczema has been brought under control. Disadvantages: The main disadvantage is that topical immunomodulators do not always work as effectively as topical steroids on very thick, lichenified eczema that often develops on the legs, arms, ankles, wrists and hands – particularly if eczema is undertreated for long periods of time. In this situation it is best to bring the eczema under control with a topical steroid first. It is also recommended that patients avoid excessive sun exposure whilst using these treatments because – although the treatments appear to be extremely safe – their long-term interaction with sunlight on the skin is not fully known. Many people find that their eczema improves on sunny holidays because of the beneficial effects of sunlight on skin inflammation. Ultraviolet light therapy can be carried out in most hospital dermatology departments, although regular attendance for several weeks can be time-consuming, and the benefits are not always long-lasting. Furthermore, too much ultraviolet light can increase your long-term risk of skin cancer, so it has to be carefully monitored. Short courses of steroid tablets can be prescribed by your GP for severe eczema flare-ups although, as mentioned above, when steroids are given by mouth they are absorbed into the bloodstream and can have many side effects that make them unsuitable for long-term treatment. Other tablets such as ciclosporin and azathioprine are sometimes needed for patients with severe eczema, but these are usually initiated and supervised by dermatologists because of potential side effects and the need for blood-test monitoring. There are a number of alternative and complementary therapies that may be helpful for some patients with eczema. Unfortunately, most have not been tried and tested in clinical trials in the same way as topical steroids. ‘Herbal’ and ‘natural’ treatments are often incorrectly assumed to be safe. It is concerning that a study carried out in Birmingham found that some ‘herbal’ creams given to families with eczema actually contained illegal amounts of steroids – sometimes super-potent steroids that should not be used in young children. We find that many patients or families have already tried food exclusion diets by the time they come to see us, but usually they have not found that these have helped. This is not surprising since the role of food allergy in eczema remains very uncertain. In young children especially, any dietary exclusions should be supervised by a registered dietitian to avoid causing nutritional deficiencies, and the NICE guideline gives some helpful advice to patients, carers and health professionals. Steroid phobia is a widespread problem that unfortunately causes many eczema patients and carers to be so wary of using topical steroids that they are unable to take full control of their skin. This fear has undoubtedly caused unnecessary suffering for many children and adults, significantly affecting their quality of life and sometimes having long-lasting physical and emotional consequences. Sometimes this also leads to patients being exposed to the risks of other potentially more dangerous – and, in many cases, unproven – treatments. The confusing and conflicting advice from the media and inadequately trained healthcare professionals (including pharmacists, practice nurses, health visitors and sometimes GPs) contributes to the problem. We hope that by dispelling the myths, patients and carers with a sound knowledge can overcome steroid phobia, and educate others in the correct and safe use of a highly effective form of treatment with a proven track record over the past 50 years.